MEXICO CITY – Three years ago today, authorities in the Dominican Republic passed a law seeking to address a statelessness crisis that has effectively stripped thousands of people off their Dominican nationality and with it, denied them a range of human rights. The crisis exploded in 2013, after a ruling by the Dominican Republic’s top Court that retroactively applied to anyone born after 1929 to undocumented foreign parents. In practice, it disproportionately affected Dominicans of Haitian descent in a context of an island shared by two nations: Haiti and the Dominican Republic. The largest statelessness crisis ever seen in the Americas was unleashed, with four generations of people being legally erased from the map and turned into ghost citizens, with no rights and no future – unable to enroll in school, apply for regular jobs or facing difficulty in seeing a doctor. An international outcry followed. In response, in 2014, Congress passed Law 169-14 that divided people in various categories. 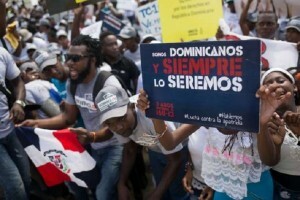 Group A included around 55,000 people born in the Dominican Republic and whose births were registered in the civil registry, but were arbitrarily deprived of their nationality by the Court’s ruling. According to the latest available data, 12,000 of them have been so far able to re-access their Dominican identity documents. However, there have been reports that the original birth certificates of some of them are being cancelled and their cases moved to a separate civil registry, which is creating chaos and fear of possible discriminatory practices in the future. Group B includes those born in the Dominican Republic but whose births were never registered. A so-called Naturalization Plan was put in place between July 2014 and February 2015 to give this group a path to naturalization. According to the government, only 8,755 individuals were able to register out of an official estimate of 53,000 potential people who belong to this group. According to the 2014 Law, they had to wait two years for the naturalization process to start. The deadline is coming to an end soon and we still don’t know how many of them have had their files approved, neither what process will be followed. The ordinary naturalization process as it currently stands requires that a passport and a birth certificate from the origin country to be produced, and it is not clear if and how their nationality will be restored. No need to say that stateless people don’t have such documents and the authorities have failed to provide any solution for this. For the 84% of people from group B who couldn’t register, the situation is dramatic. Many of them remain stateless, which means they’re unable to move forward with their lives. They’re limited in their education, they face huge obstacles to access healthcare services, and they can’t work legally nor travel freely inside and outside their country. Today, they have no available avenues to get their Dominican nationality back. In 2014, President Medina showed courage and great political will by putting forward the Naturalization Law. But the plan fell short of solving this urgent crisis and did not comply with the Dominican Republic’s obligations under international law. Last year Medina was re-elected for a new four-year mandate, which provides a renewed opportunity to put an end to the largest statelessness crisis of this continent. The roadmap to resolve such a complex situation may not be easy, but every day that authorities continue to turn a blind eye to it, and more children of stateless people are born into “ghost citizens” in the country, the more intricate the situation becomes. As a matter of urgency, the authorities in the Dominican Republic must deliver identity documents to all individuals in group A, immediately facilitate the restoration of nationality of the 8,755 people of group B through an expedited process and provide a clear and simple path to restore the nationality of all those who were unable to enroll in the Naturalization Plan and were previously identified with the support of the United Nations High Commissioner for Refugees. An independent mechanism should also be established, with the participation of Dominican human rights organizations, tasked with oversighting this processes. By the end of this year, the mechanism should be able to produce a first independent evaluation of the initiatives carried out since 2013 to address the statelessness crisis, including specific recommendations to the authorities to restore the nationality of those affected and prevent any future arbitrary restrictions to the right to nationality. The statelessness crisis that has shaken the Dominican Republic since 2013 has shown the tremendous impacts of discriminatory policies on people’s lives and rights. The country that was once seen by many as a tropical paradise has become the home of the largest stateless population of the Americas. Why are the Dominican Republic’s authorities insisting in denying its youth from going to university and integrate in society, and to deny the right to receive adequate medical care for those in need? Why do they insist in trapping in endless poverty those already excluded and marginalized and for all the stateless to be able to realize themselves as individuals and help their country to advance towards progress? Three years after Law 169 was passed, much more needs to be done to solve the statelessness crisis that still affects thousands of people in the Dominican Republic. Dominican political leaders and all sectors of Dominican society must be ready to act now. The above mentioned roadmap can be the first steps towards ending this crisis and ensuring the rights of everyone in the country.